I’ve been playing a game lately about exploring a place where a man-made disaster has bent the very fabric of reality itself, creating bizarre anomalies and strange creatures. I explore the abandoned remnants of cities and laboratories, scrabbling for resources and seeking answers to the nature of the disaster. This game is so good, it’s distracted me from playing STALKER. Jonas Kyratzes‘s new game Phenomenon 32 has a similar setting to GSC Game World‘s Chernobyl shooter: the familiar modern world, distorted by the folly of science unbounded by ethics into a place where the very rules of reality can’t be trusted. This isn’t a new premise: STALKER is indirectly based on the 1972 novel Roadside Picnic, and the seminal work for this concept is probably the “Dying Earth” series. It’s sheer coincidence that I was playing these two games at the same time, but there are several good reasons why Phenomenon 32 is winning out. Phenomenon 32 takes place in a world where the atomic bomb was never developed. Instead, scientists experimented with the eponymous Phenomenon, which served as the basis for a Reality Bomb. World War III arrives in the 1950s, and Earth is destroyed, leaving the only human survivors huddling in the newly-built Moon Colony. But while the Earth is gone, there’s something in its place, and the resources found there are key to helping the Colony survive. Phenomenon 32 is a thin, tinny game, distorted by the static that pervades the atmosphere of the new Earth. It’s displayed in black and white, and it’s never quite clear what you’re looking at. The world map is an indistinct mess of noise that more closely resembles a dirty microscope slide than a landscape. The player controls a ship or drone that’s roughly spherical, but the resolution is low enough that no details are visible. The dangerous creatures that inhabit the wasteland are even more indistinct: strange circles, lumps of static, or stars of tentacles and eyes that fire clouds of shiruken-like projectiles. At times, the environment itself is unintelligible: floating stones and rock bridges, scattered with anomalies that nullify gravity or rip at the ship. At other times, the world is disturbingly familar: rows of shelves in a mall, beneath signs promising happiness through materialism. The sound is similarly unsettling, with atmospheric wind noises mingled with haunting music, and over it all the almost 8-bit sounds of weapons and damage. The German term unheimliche comes to mind. It means uncanny, but it can be read “unhomely.” The Earth is no longer home. With all the strangeness, however, Phenomenon 32 maintains an internal fiction that is consistent both with its story and with the tropes of video gaming. The primary goals of the game are exploration and resource collection: collecting resources allows the player to upgrade her ship, and upgrades allow her to find new resources. 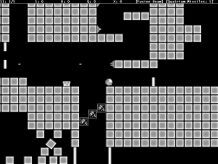 Cleverly, the Phenomenon resets the state of areas after the player leaves, meaning that the player can’t ever run out of resources. A scientist in the game remarks on how convenient this is, but it isn’t the self-aware fourth-wall-breaking of a Metal Gear Solid tutorial. It feels genuine in this world. Appropriate as well are the types of resources: four fictional substances with scientific-sounding names like “Octium-B” are produced by the Phenomenon, and each tends to appear in a different way. Saganite is common, with Quatrium a bit rarer; Octium-B forms as stalactites, and Xordite is so rare that it never appears in large heaps. It’s believable where these substances appear. Likewise, the game never asks you to accept the trope of multiple lives; any expedition where the player character dies is deemed a failed simulation, which means that the actual ship is never destroyed. I’m biased in my enjoyment of Phenomenon 32, of course. I love exploration platformers, and this is a great example of the genre (as much as it pains me to use that hated word). It’s less Metroidvania and more Zelda II, but it’s good to get some variety. The difficulty curve here is also strikingly similar to STALKER: it starts off punishingly difficult, with death coming early and often. But with a bit of resource collection and a few upgrades, along with an increase in player skill, the obstacles become manageable. Phenomenon 32 is a departure from Kyratzes’s earlier, mostly first-person puzzling works, but it shows his usual dedication to worldbuilding and mimesis. I’ll go back to STALKER once our scientists fully understand Phenomenon 32. The Moon Colony is depending on me. One of these days I will have to get some kind of Windows emulator, so I can play Jonas’s games. Hm. The competence demonstrated in its construction is strong. But I don’t think I can punch through that initial difficulty barrier to see the game.